While science is constantly making new discoveries, we tend to think of the science of gross anatomy as pretty well wrapped up. The body is the body, it hasn’t changed much over the last 40,000 years or so, and anatomists had long ago identified every structure there is to identify, right? Well, two surgeons from Belgium would argue differently. A “new” ligament was recently discovered in the human knee which was, up to this point, considered part of the Anterior Cruciate Ligament (ACL). 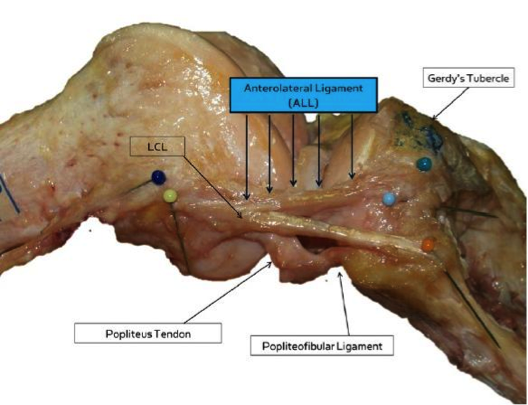 This new ligament, dubbed the Anterolateral Ligament (ALL) was noted in 97% of cadavers studied by Drs. Claes and Bellemans. To most, save us anatomy geeks, this news may not be earth shatteringly exciting; however, it does have a significant impact on anyone who has ever had a knee injury or knee surgery. The ALL is hypothesized to control internal tibial rotation thereby affecting the sensation of giving out during activity, often referred to as the pivot shift phenomenon. The anatomical research has shown that a tear in the ALL increased the amount of pivot shift present with an ACL tear. Researchers are now developing a surgical technique to correct ALL injuries and this may be a breakthrough in the treatment of patients with complicated or recurrent ACL injuries. If you are suffering from a knee injury, or if you have a chronic or recurring knee problem that includes a giving way sensation it is always a good idea to have it thoroughly assessed by a health care professional to determine the root cause of the problem. This new discovery may have significant implications on how you should be addressing both your treatment and rehabilitation.